Fact about diesel engine - Diesel-engined cars are currently less popular than gasoline engines. In fact, in various parts of the world, diesel-engined cars are considered more resilient than gasoline-powered vehicles. There are several diesel engine facts that most people do not know yet. In this article will be explained some facts that owned by the diesel engine. 1. Diesel engines have greater heat efficiency. Thus, the use of fuel will be more economical than gasoline engines. 2. The diesel engine more wasteful also disputed, because with high cetane and greater torque than gasoline engines, impact on fuel consumption more efficient. 3. Diesel engines are more durable and do not require electric igniter. That way, the chances of trouble are smaller and the maintenance is smaller than the gasoline engine. 4. The torque on the diesel engine does not change at high-speed level. This means that the average torque diesel engine is the same great, but it depends on each brand different characteristics. 5. Many people say diesel engines are less powerful than gasoline engines. But along with the advent of the use of turbo technology, diesel engines are much more powerful than gasoline engines. 6. Maximum combustion pressure is almost twice the gasoline engine. This affects the sound and vibration of diesel engines larger than gasoline. But with common-rail technology, symptoms like this have diminished. 7. The diesel engine fact history in the past, diesel engines were noisy compared to gasoline engines. Until now there are still many people judged like that, but actually, the modern diesel engine has been much quieter than in the past. 8. the combustion pressure is higher, then the diesel engine must be made of high-pressure resistant material and must have a very large strong structure. 9. diesel engines require precision fuel injection systems. This means the diesel engine needs time and the right amount of fuel when spraying inside the engine during combustion. 10. Diesel has no spark plug to burn fuel and air mixture. Hot compressed air that ignites the fuel. 11. diesel engines have higher compression ratio and require greater force to rotate it. 12. Diesel engine fact equipment is generally more expensive than cars that use gasoline engines. Of course, this comparison applies to the same models or are in the same segment. 13. The diesel engine fact history in the past, diesel-engined cars was identical to black smoke. It makes people think diesel engines always puff up excessive smoke and emissions. Diesel engine pollution facts with use of quality fuel with low sulfur content make the smoke no longer visible and the waste gas content is not harmful to the environment. And powered by advanced diesel engine factory. 14. The diesel engine has the best thermal efficiency compared with inner and another burning engine. It is not separated from the compression ratio owned diesel engine. The higher the compression ratio of a machine, the higher the thermal efficiency obtained. 15. During the right ignition time, the diesel engines do not experience knocking (detonation). What is knocking or detonation? Knocking or detonation is a condition where the fuel and air mixture inside the engine combustor burns earlier than the required ignition time. 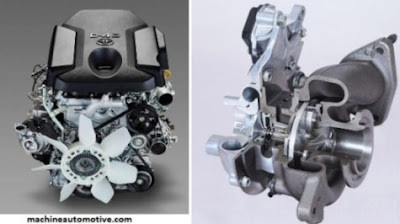 The diesel engine will not experience this because the ignition timing on the diesel engine is the time when the fuel is injected into the combustion chamber. So when the engine does the compression step, the compressed inside the engine is pure air (not a mixture of fuel and air). Logically the air will not burn first before the fuel is injected. That's some interesting facts that are on a diesel engine. If described there are many other interesting facts about this diesel engine. Hopefully this article useful, please share.